Hi Everyone! Well. . .it's been hell reorganizing my craft room but I've progressed a lot since I've started a week ago. I'm really excited that I'm about done with the reorganization. I've posted a few pictures on Stampin Inspirations if you care to take a look at what I've done so far with my room. Before I had started with the reorganization, I had created the bird image on my card on Adobe Illustrator and I'm happy to say that this is my very first computer drawn graphic image! Whoohoo!! I know it's a simple image but it's my very own so I'm happy about it. 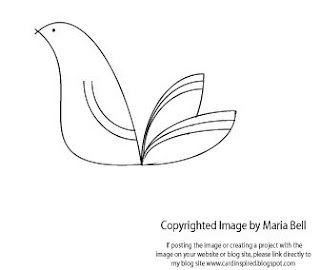 My plan is to create images. . .like stamp images on Illustrator and print them out to create images for my cards. I printed the image on to cardstock using my ink jet printer then colored it with Copic Markers and rubbed ink around the image using my sponge dauber. To add a little dimension to the image, I added a bit of Crystal Effects to that tail feather! If you want to try the image out, click on the image. If you print it directly from the Internet rather than saving it as a file, it will print at 2.25 x 1.5". You may adjust the size of the image by adjusting your printer scale. The image on my card is approximately 3x2" in size. I had created the image at that size but for some reason when printing from the Internet, it shrinks the size to 2.25 x 1.5"
If you save it on to your computer, when printing it the image size may not be to scale. The print size will be dependent on the computer program you are using. Anyway. . .if you decide to use the image to create a card and post it on your blog site or website, I do ask that you credit me for the image by adding a link to my blog site: http://www.cardinspired.blogspot.com/ to your post. That's all I ask. Please don't direct link to the image. Hi Everyone! I just wanted to share this video. This one is called "Droplets" I wonder if this song will be released by Colbie Caillat one day! I love Colbie Caillat. On this video, Colbie is singing with a singer named Jason Reeves and I read that he just got a record deal. This song would be a fabulous single! What do you think? They have a few duets together that are not on an album but are on YouTube. Jason also has a bunch of songs on Youtube but he doesn't have an album as of yet. I think he'll make it big!! Anyway, tell me what you think of the song! I'm still reorganizing my craft room. I believe I will be done in about 3 days. . .I'm crossing my fingers!! Will be back soon! Have a great week everyone!! Hi Everyone! I just wanted to let you know that I'm on a blog break! I hope it'll be a quick one. I'm in the process of reorganizing my craft room. . . .read here how it all started! LOL! See y'all in a few days!! Hi Everyone! 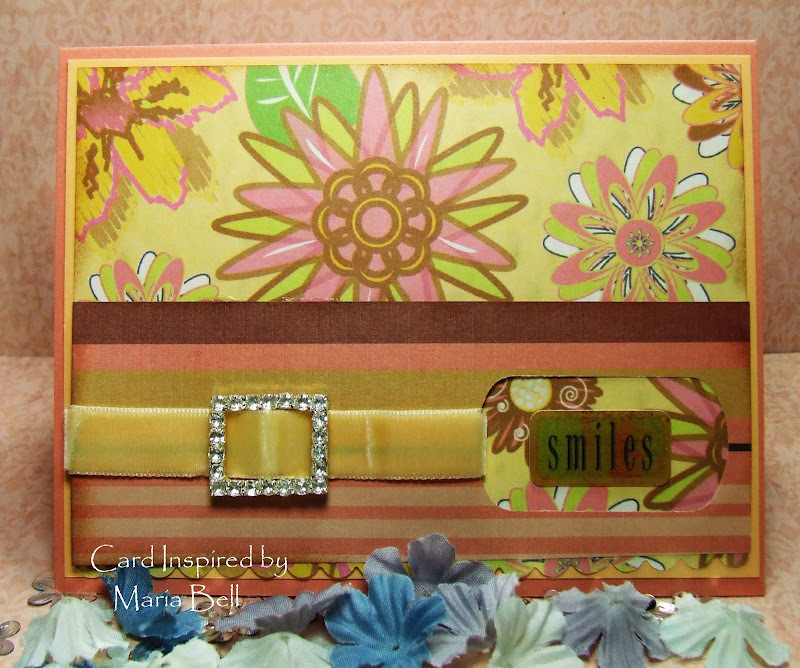 This card was inspired by Mel's template of "Mel Stampz" that she provided on her blog site. 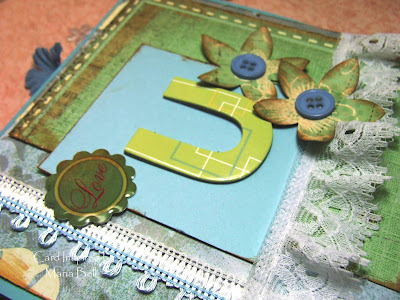 I liked the idea how she added stitches to her card so I added stitches to my card too. I used fibers for my stitching. . .I wanted to do something different and I have a ton of these fibers. Remember when they were popular several years ago. . .well, I still have them. I don't see too many people using these fibers on their cards and quite honestly, I really don't know what do with mine! If you've been reading my posts for the past few days, you'll know that I've been focusing on Mel's templates and projects. She has lots of creative ideas on her blog so this week, I'm going to work on them. Here is another card I made with Mel's template. Again, I used fibers for the flower but rather creating a flower card, I adhered the layered flower on to a 5.5 x 5.5 square card. I am so much fun making these cards. 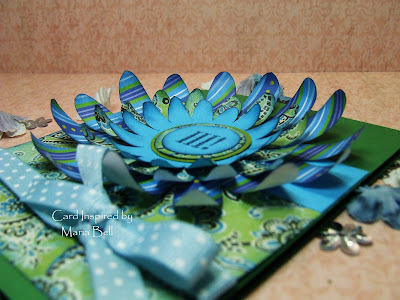 Be sure to stop by Mel's blog site to check out the template and the other fun stuff on her blog!! 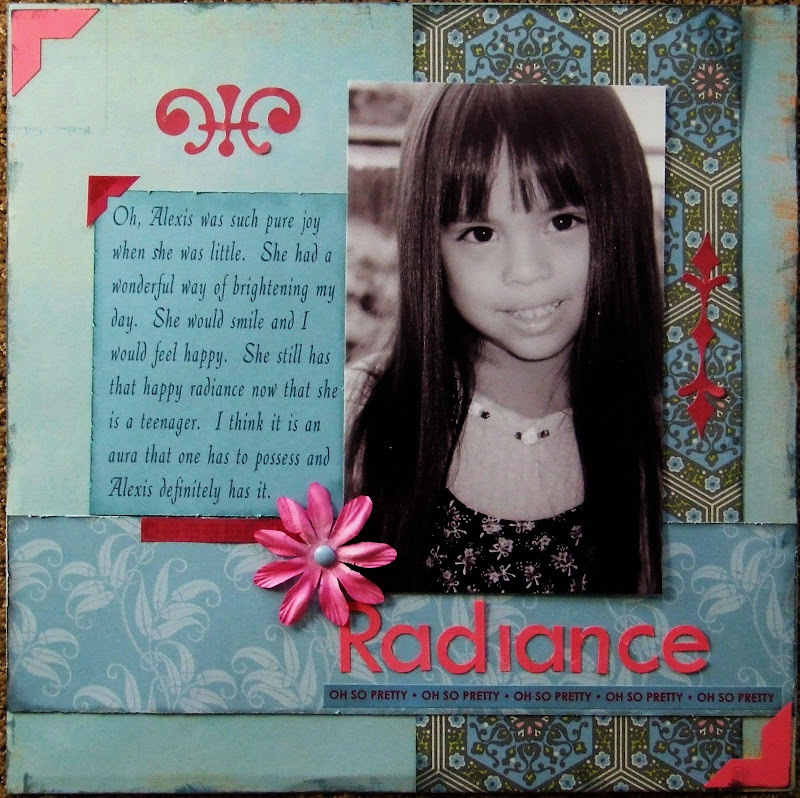 Mel has tutorials on how to create your own templates and it really inspired me to come up with my own stuff. I've had Adobe Illustrator CS2 for about a year but it's so darn complicated and well, I'm no techie so I rarely used this powerful program. I primarily use it to create templates for my Craft Robo (Wishblade) but I typically use templates made by other people because I don't know how to create my own graphic images on Illustrator. From Illustrator, my Craft Robo (Wishblade) cuts graphic images directly from the program. Illustrator now comes in a newer CS3 version. I have CS2. This program is primarily used by graphic artists and illustrators so it's a very expensive program. The complete CS3 package run about $600 and the upgrade to CS3 cost around $200. I have it on my computer because my husband works in the computer/IT industry. I would not buy it for myself. It's not like I'm planning to become a graphic illustrator! LOL! I decided yesterday to follow a few tutorials on how to draw on Illustrator and WOW! OMG, I found a tutorial that teaches you how to create simple flowers on Illustrator! It's so darn easy to create them! I couldn't believe that I've never used this program to create my own templates! Anyway, I created this flower template yesterday. As a matter of fact I created 5 different types. I'll post them as I make cards for the templates! As you can see, the flowers are very layered and 3D! 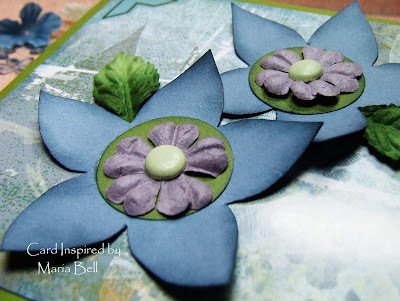 It does take a bit of cutting but if you don't mind. . .well, layering flowers are so fun! What I do when I cut these templates. . .I watch TV! LOL! It really helps from getting bored while cutting. It sort of kills two birds with one stone. 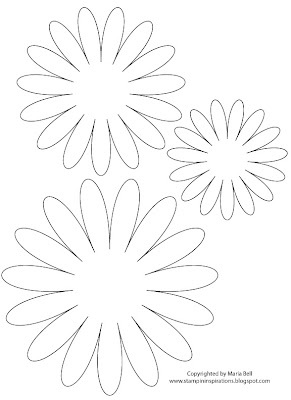 Here is the flower template I created yesterday. Click on the image and it will enlarge. It'll look very, very large but if you print directly from the Internet rather than saving the template, it'll print to scale. If you save it and print it from your file, you may need to do a test print. The print size will be dependent on your computer program that you used to print the image. For example, when I print from Photoshop, it prints a size larger which is okay too. You can create different size flowers! Thanks Mel for inspiring me to create my own templates! Hi Everyone! 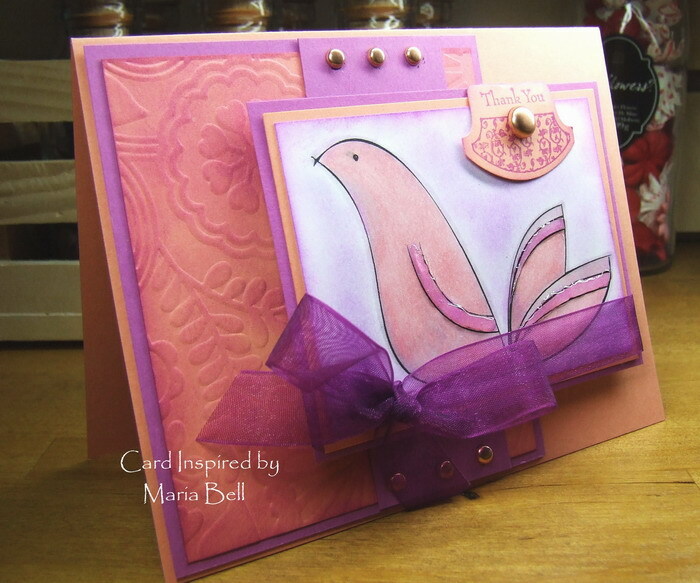 Well, this is the last card that I created using the pretty designer paper. You must be tired of this designer paper! LOL! I did say I had made 3 cards using the paper so don't say I didn't warn you! 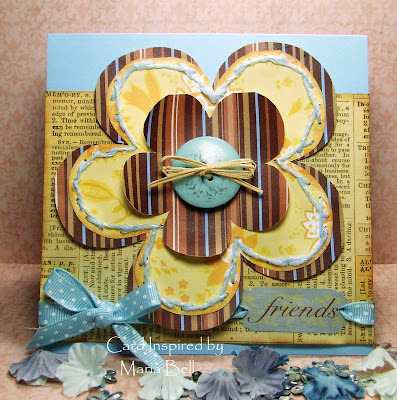 Again, I used basically the same materials with this card as I did with my other two cards. The sentiments are different but I used the same brands, Making Memories for the ribbon and Basic Grey with the sticker. 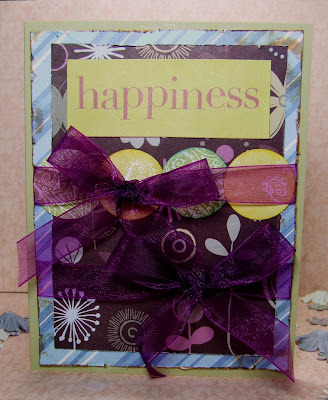 With this card, I, again, used the negative side of a punched designer paper. This time I used SU Scallop punch to create the negative punch. Gosh, I've been feeling so tired for the past few days. It may not seem like it because you read that I cleaned out the pond, I craft, I clean, drive here and there, etc. but while doing all these things, I feel extremely tired inside. I sort of force myself to do a lot of things but half of the time, I feel lousy. I think it may related to the fact that I sleep late and I have a major allergy problem. When I wake up, my eyes are always burning, I'm always sneezing, my nose is constantly running. It tires me out. I've been taking Claritan but it doesn't seem to help much. My nose still runs. I don't sneeze as often but I still feel a little congested. It's very annoying. Anyway, enough of my whining. I hope you all have a wonderful day! Hi Everyone! I wanted to share my clean waterfall and pond in my back yard that me and my son cleaned up yesterday. Prior to cleaning it was sort of yellow looking because algae started to grow at the bottom of the pond due to the hot weather for the past weeks. Yuck. It was looking pretty ugly. I drained the pond and my son and I cleaned out the sediment and algae located at the bottom and to the sides of the pond. I wish I took a photo of the guck but I was thinking of taking photos while we were working on it. Anyway. . .just wanted to share my hard work! LOL! I need someone to pat my back and say "good girl, Maria". Too funny! I've been asking my husband to do it for weeks and he kept putting it off. Because he is on a business trip, I decided to do it myself. If I did it while he is around, he'll get irritated and feel forced to clean it so I decided to wait to do it when he was away. The picture to the right is the pond that was filled with guck but now it's all clean. You couldn't see the bottom of the pond when it was dirty. 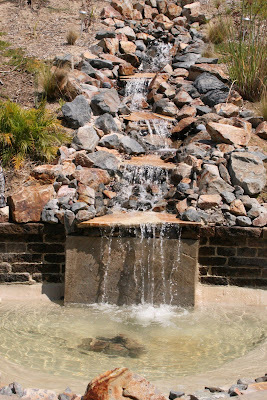 The rocks in the center holds the light fixture at the bottom of the pond. It lights up the water at night. Hi Everyone! 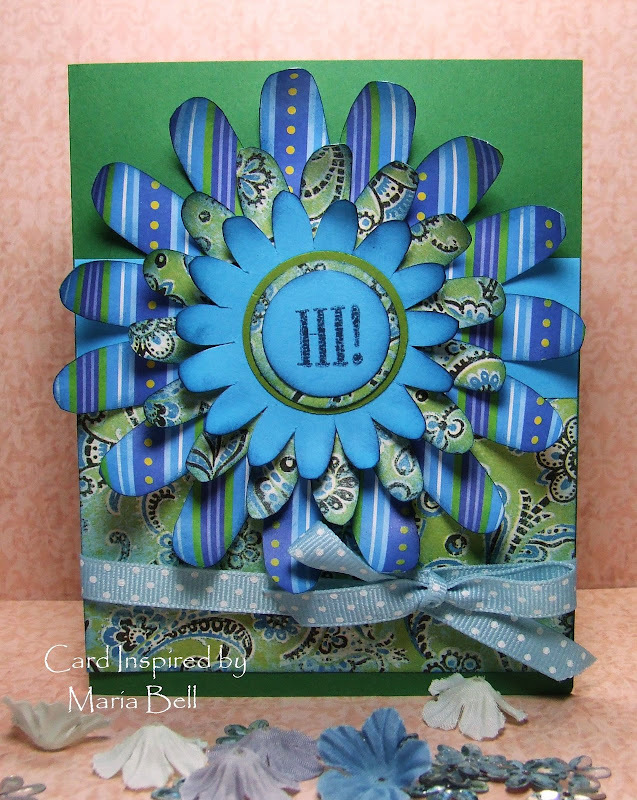 Just another card I made with the same pretty paper that I used for my card yesterday. I really like the colors of this designer paper. Unfortunately, I don't know who makes it. I had pulled the paper out from a stack of designer paper and I forgot to look who made it and I'm not about to go through all my scrapbook paper to figure it out! LOL! Again, I used the Basic Grey stickers and Making Memories ribbon. I love the rhinestone buckle on the ribbon. The ribbon set came with the buckle. If you scroll down to my previous card, you'll notice that I punched the key tag shape using my SU Key Tag punch. . .well, if you look at the card above. . .it's the negative side of the punched shape from my previous card. 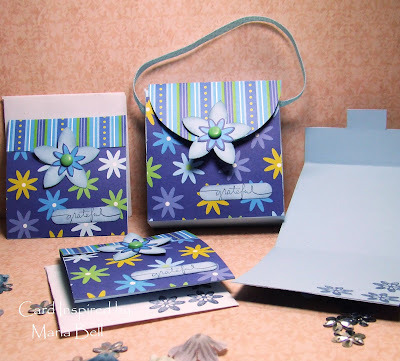 I like using the negative side of my punched papers because you can actually use them for other card projects so be sure to save the negative side when you use your punches. I made one more card using the same paper and I'll post it tomorrow! I'm trying to spread my card posting because there are days when I make more than one card and I'll post all of them on one post but then there's days when I don't have the time to craft and I end up with no posting. Anyway, hope y'all are having a wonderful week! Hi Everyone! Blogger was being a butthead earlier but it's all good now! I couldn't load my photos but I decided to try again and it worked! Yay! My DH is on a business trip so I'm staying up late tonight! Yay! He doesn't like it when I stay up late and when I mean late, I mean like 3 in the morning. Anyway, I made this card last night. 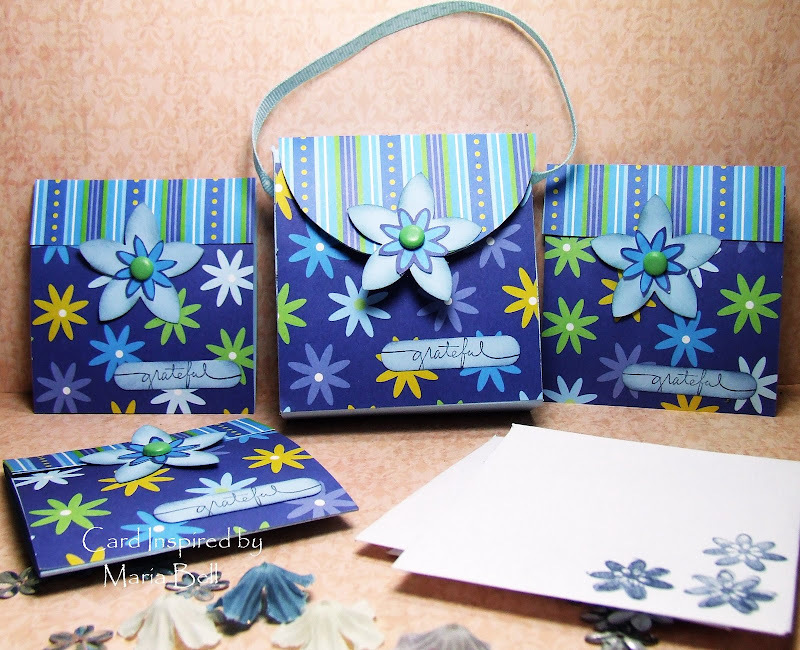 I actually made 3 cards using this pretty designer paper. I'll post the other two tomorrow! Unfortunately, I don't know who makes the paper. I had pulled it out from a stack of designer paper and forgot to check who made it. Today was a busy day! I brought my daughter to the DMV and she passed her driver's permit test! Yay! I also cleaned out our waterfall and pond in our backyard. I asked my husband to do it for the past few weeks and he kept putting it off so I asked my son to help me clean it out. Because my husband is on a business trip, I decided that if my DH won't do it, I will. Now the waterfall is nice and clean! Gosh, I got a lot done today but I didn't have time to craft so I'm going to stay up late tonight so I can squeeze in some crafting time! Hi Everyone! Just another card using the lace that I bought. 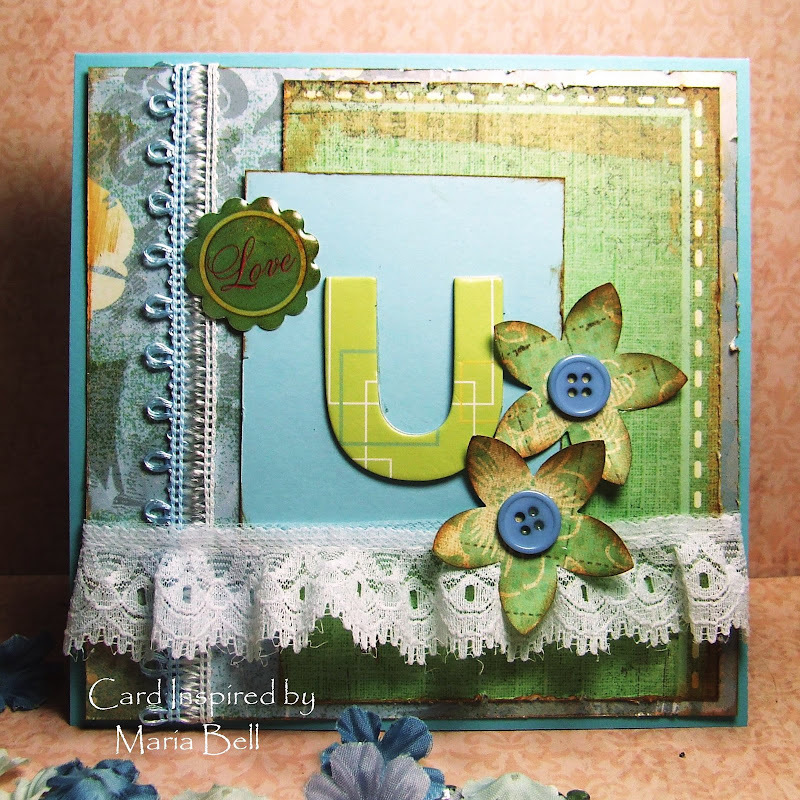 I'm having fun with the lace and the chipboard alpha "U". Nothing much to the card. . .just laying different elements on the card. Scroll down to my previous post to check out the other card I made using the lace! Hi Everyone! My daughter had a Key Club meeting today and while waiting for her, I stopped by JoAnns and wandered over to the fabric section. There was a section that had a sign that said "$1 Sale" and oh, I could not resist taking a look. Well, there was a bunch of rolls of lace for a $1 each. They were calling out to me to buy them so. . .I did. LOL! I bought about $10 worth of lace and other rolls of fabric ribbons. 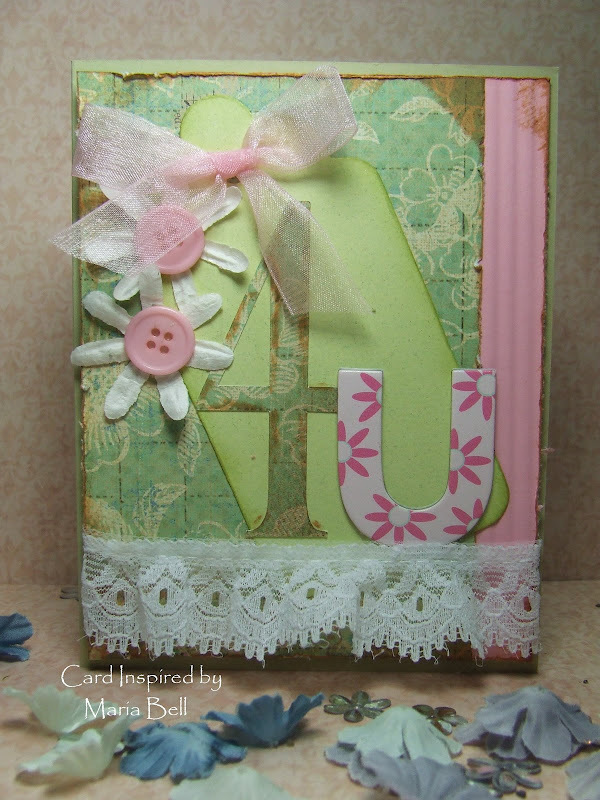 So. . .I decided to create a card using the lace that I bought! I like the feminine look to the card. What do you think? I guess I'll be making a bunch of cards using the lace! Hi Everyone! 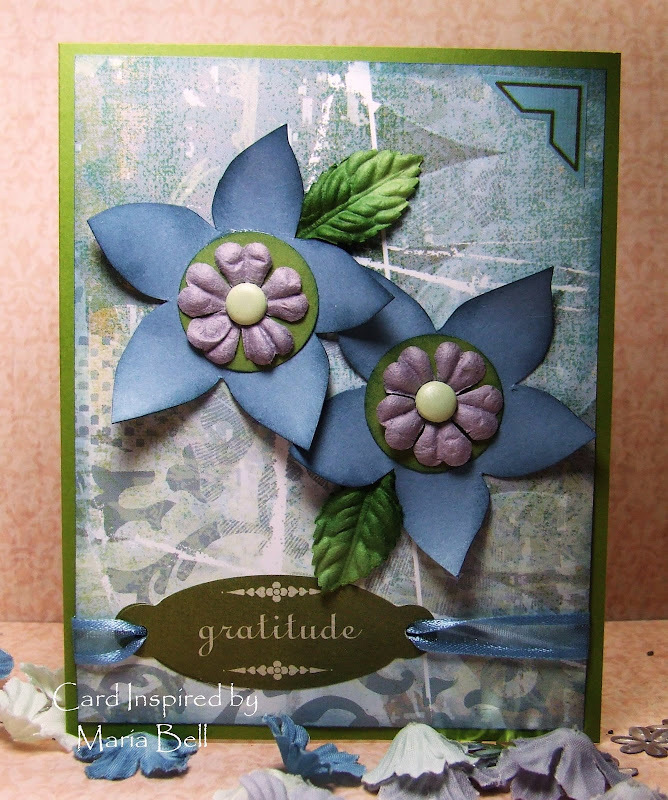 I, finally, found time to make a scrappy card today! Yay! I decided to create my own flowers by drawing the flowers on a cardstock and cutting the image out. I added a 1 inch circle to the center and prima flower. To top it off, I added the brad to secure the flower to the designer paper. Nothing much else to this card. Hi Everyone~ I decided to do something different and alter a notebook. I haven't altered a notebook for a while now so I decided to work on. All I did was adhere the CTMH "Silhouette" Level 2 paper on to the bottom half of the notebook. The notebook already had a pretty print on it but it wouldn't be "my" work if I didn't cover it up a little. 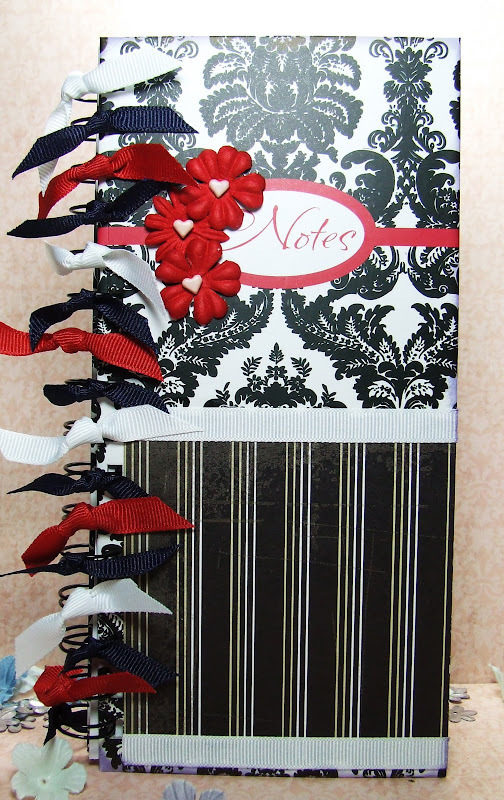 To finish up the notebook, I added the ribbons and the prima flowers. It took about 20 minutes to complete the notebook. Nothing much else to this simple project! I don't have much to say today. . .I have to cook dinner in a few minutes so I just want to finish up this post. Hope y'all are having a wonderful evening! Hi Everyone! I am proud to say that I made 2 layouts in one day! Yay! Check my other layout on my previous post. Why am I proud of it? Typically, I do 2 layouts a MONTH, therefore, creating 2 layouts in a day is quite an accomplishment! LOL! Here is a little info on my scrapbook layout. 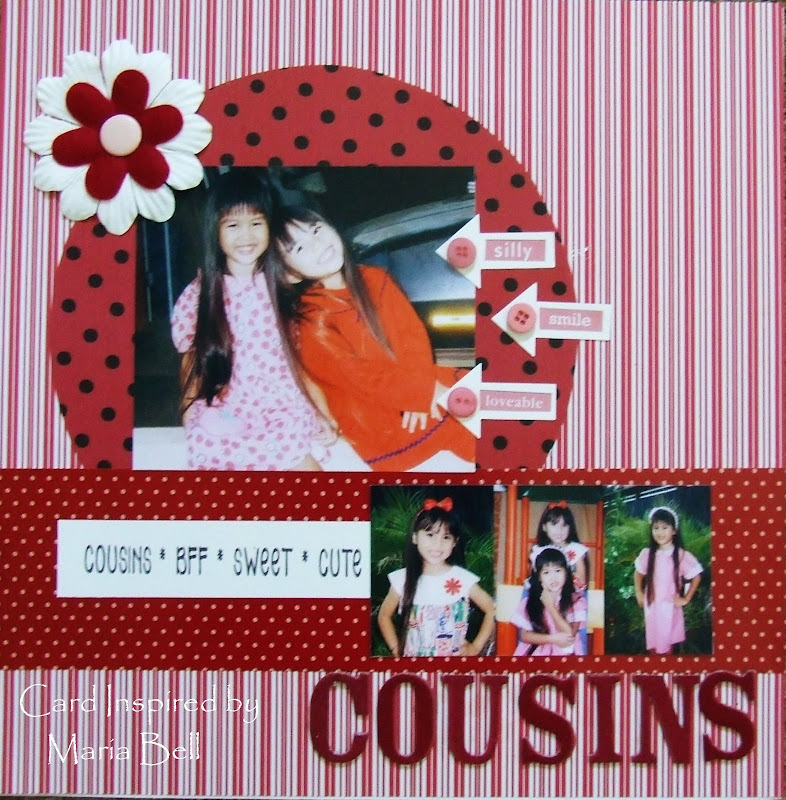 . . .it was a little time consuming to create this layout because with all the scrapbook papers and cardstock I had, I could not find a red scrapbook paper or cardstock that had a similar tone. It would be either too orange, too pink, too burgundy. . .I am sadly lacking in red papers. Well, after digging through a ton of scrapbook papers, I finally found 2 that were similar in tone. Actually, the red/white polka-dot band going across my layout came from a cardboard package. It was the backing of a package of scrapbook embellishments I had purchased. It matched my scrapbook papers really nicely. Hey. . .you gotta improvise! LOL! If it works, hey. . .why not! The pictures are of my daughter and her cousin Melissa when they were little. They were best buddies back then and very close. They did everything together. Sadly, as they grew up and attended different middle school and high school, they barely talked to one another unless we got together for a family gathering. It was sort of awkward for them because we sort of expected them to be close but they were polar opposites in personality and interest. The picture is of the fun times they once had together. Hi Everyone! I decided to create a layout rather than making a card today. 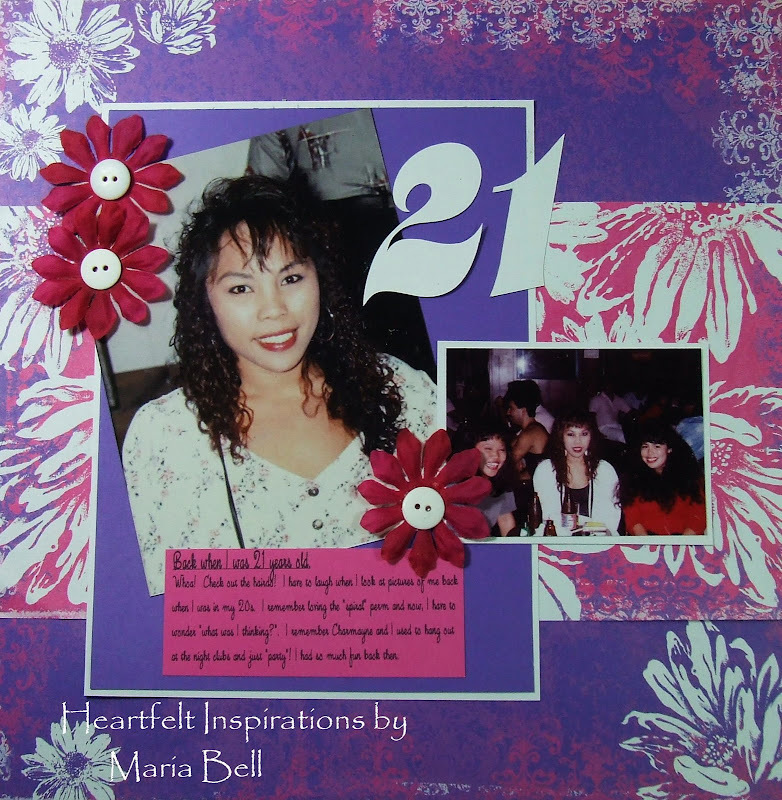 I have a tendency to neglect creating a scrapbook layout because well, I'm a little layout challenged! LOL! It takes me a little longer to come up with a layout that I like. A lot of times, I don't have materials that match and I'm not good with the "hodge-podge" look. 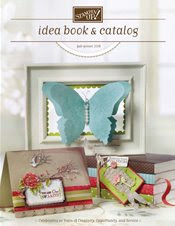 I have this problem with wanting to have everything sort of match which isn't quite necessary with scrapbooking. I need to get over that hump. Anyway. . .just a few details about my layout. It's a photo of my daughter when she was about 4 years old. She has a radiance about her . . .you know, the saying "she lights up the room when she walks in". . .well, she has that aura about her. I wanted to create a layout about her "radiance". I didn't do any special techniques with this layout. I did distress the paper and rubbed a little distressing ink to give it a shabby chic look. Other than that, not much else. Hi Everyone! Hope y'all had a wonderful July 4th! 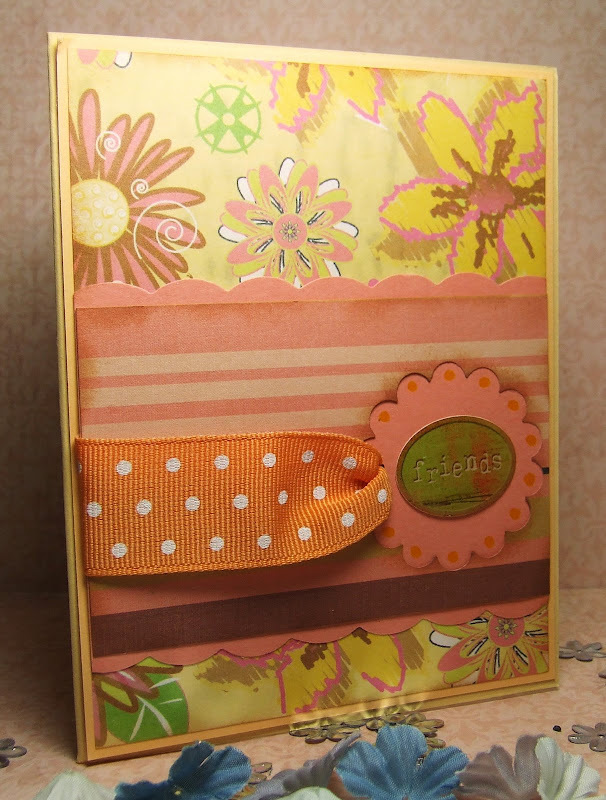 Well, I call this card my "hodge podge" card because I pulled out designer paper from my scrap pile and the colors weren't coordinated but decided to see what I could come up with. I also had a few circle punched paper that for good measure, slapped them on too! LOL! Anyway, not my typical type of card to make but it was fun making the card nonetheless. Nothing much else to the card but just slapping on the ribbons and sticker. Hope you like it! Hi Everyone! 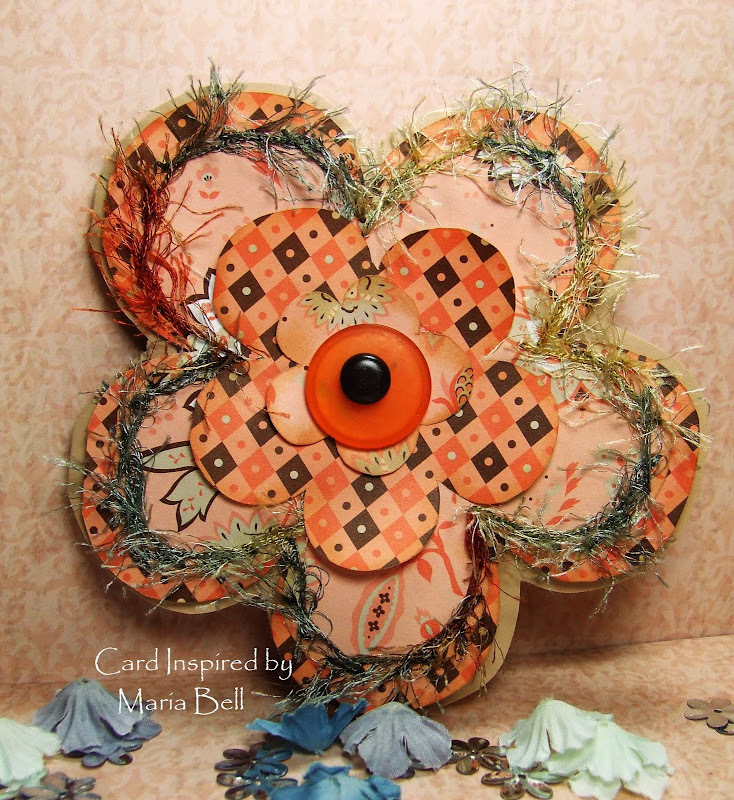 Card Inspired was graciously awarded the "brilliance award" by Ila at Artfully Ila! If you haven't seen her work. . .well, go there now. You will be impressed. 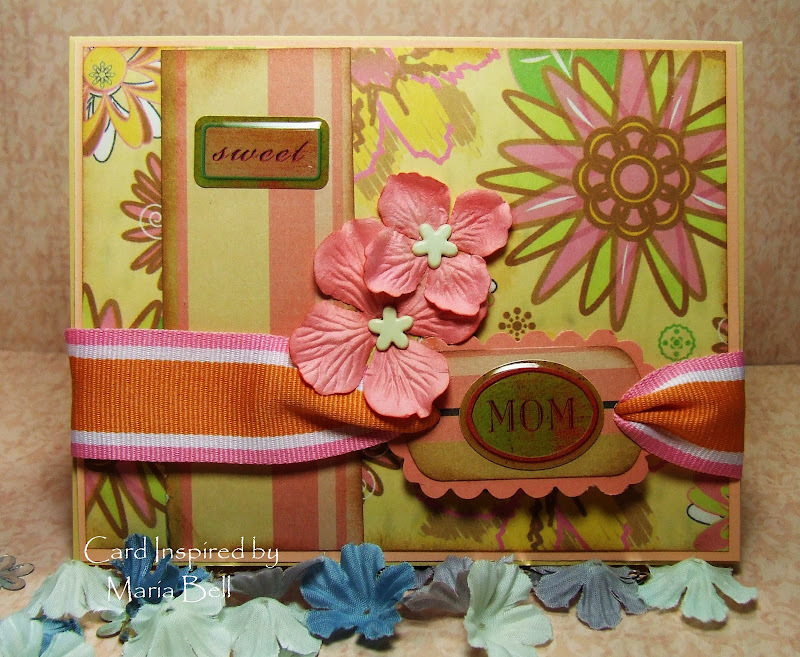 She is one talented card maker! Stop by and say hello!! I'm suppose to award others but honestly, there's too many bloggers that deserve this award. . .I don't want to pick only a few. I'll feel like I left someone out . . .so, I'll award all of you who visit my blog site. Thank you, Ila. . .it's honor that you thought of me! !